Xoom, xoom, xoom. That’s how fast this Android Tablet runs. For all the techies out there who love modern technology, the Motorola Xoom is the next step up, but is newer always better? 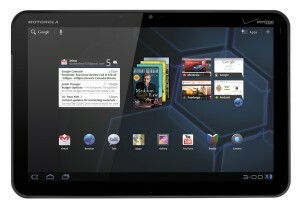 With competing tablets like the Xoom and the iPad, we can decide the worth of purchasing Motorola’s creation. The question we must ask ourselves is: What are some attributes that stand apart from its iPad counterparts? Would these differences influence the problem solving part our decision-making? The following competitive products are broken down into mobility, display, and functionality. Tablets are mostly used by those who utilize the functions for work and/or school. This Motorola entity appeals to the consumers who adore personalizing and customization. Tablets are meant for their usability and convenience; the Xoom gives you the interactive experience. The Honeycomb operating system supported by the Motorola Xoom (owned by Google) gives you, the user, the best of all Google owned applications. In example, those who are lost and are in need of direction, the Xoom’s advanced Google maps give it GPS capabilities worth having. In today’s society most technology appeals to just about anybody; however, this can be a great tool for work because better of practical email and other document viewing as well for student ambition through school. The Motorola Xoom offers a great experience in tablet usage. As a buyer when determining the purchase of a tablet, it is important to fulfill your needs. This Android device gives you manipulative control over icon arrangement and use of widgets. There are many attributes that make the Xoom worth its price and making it a wonderful tablet for those wanting to step outside reality and have something as sweet as honey.